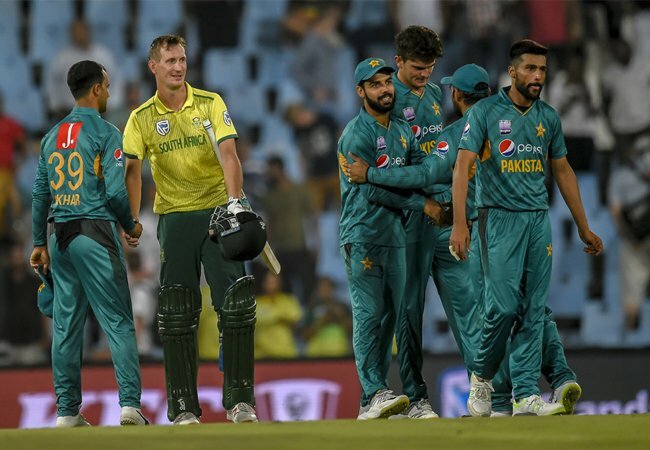 A clinical bowling performance gave Pakistan a consolation win in the final T20I in Centurion, which also happened to be the final game on what has been a disappointing tour for the visitors. Having been put into bat, the tourists posted 168/9, and David Miller’s Proteas could only reach in 141/9 in reply as the away bowling attack did an excellent job of taking regular wickets and keeping things economical. A Chris Morris 29-ball 55* came in vain for the hosts. Frequent breakthroughs also hampered Pakistan’s chances of notching a huge score in the first innings, despite a few batsmen getting starts. Beuran Hendricks was particularly potent for the Proteas, recording career-best figures of 4/14 in a masterful display of T20I seam bowling. Babar Azam began rapidly for the tourists, smashing Junior Dala for four boundaries in the second over of the day, but he fell for 23 from 11 as the impressive Morris (2/27) picked up his first scalp. Fellow opener Fakhar Zaman departed for 17, while Mohammad Rizwan, promoted to three, added 26 runs before becoming Lutho Sipamla’s (1/25) first victim in international cricket. Shoaib Malik then looked typically assured for his 18, but a comical run out prevented him from amassing a decent score, and late cameos from Asif Ali (20) and Imad Wasim (19) were quelled before any real danger had mounted. Andile Phehlukwayo (1/41) was punted for three sixes in the final over by Shadab Khan (22*) to drag Pakistan to 168/9, as proceedings looked rather poised at the half-way stage. The second innings saw Shaheen Afridi (1/23) and Imad (1/19) immediately make inroads into the South African top order, the former dismissing Reeza Hendricks (5) with a sharp caught and bowled, and the latter picking up the wicket of Janneman Malan (2) leaving the Proteas flailing at 14/2. Mohammad Amir then struck with his first ball to send back Heinrich Klaasen for just two. Things were looking increasingly bleak for David Miller’s men. At 59/3 after ten overs, a significant acceleration was required for the home side to get near their target of 169. Miller (13) was the next to fall, mistiming a sweep straight back to Shadab, before Pakistan dealt their opponents a massive blow in dismissing Rassie van der Dussen for 41, the 29-year old edging a drive off Faheem to Malik at mid-off after looking very confident throughout his knock. Shadab (2/34) then had Phehlukwayo pinned lbw for 10, before Morris let loose. He smashed Faheem for 21 in an over, reigniting hopes of a South African resurgence, but wickets continued to fall around him and the asking rate became too steep. Hendricks (3) and Dala (5) both fell to Amir, who finished with figures of 3/27, while Sipamla was bowled for a golden duck in the penultimate over by Faheem (2/38) as things drew to a tepid close for the hosts. With 40 needed from the final over, two sixes from Morris took him to an exciting 55* from just 29, but the game was already out of sight. A good way to conclude the tour for Pakistan, and an anti-climactic way for South Africa to round off what was a successful series for them.